Canopy Mart stocks and sells a huge range of tents, marquees for parties and events, and even portable car ports and garages to keep your vehicles clean and dry where you are. Whatever your tent and canopy requirements, there will be something at Canopy Mart that will meet your needs — and all at a reasonable price, even BEFORE you apply your Canopy Mart Coupon Code! Their online catalog makes it easy to browse all the Canopy Mart stock, and even large marquees and portable carports can be shipped out to your home within a few days. Their selection includes the ever-popular Shelter Logic brand, and at very competitive prices! Add our 8% off coupon code and save even more! The sizes for the portable garages and shelters range from a tidy 6×6 that makes for a great, economical little shed, to the popular 1-car garage sizes (12 x 20 x 8) round and house style w/ galvanized steel frames, clear on up to an ample 12 x 20 x 12 Barn Style garage (with a galvanized steel frame instead of powder coated), to a 30 x 30 x 15 3-car model (galvanized frame) and even utility buildings (up to 40 x 60 x 18 domed truss buildings). When I sold these separately a few years ago, it was typical for municipalities to purchase them for storing their highway machinery and tools. If you need a storage shed, but want something a little more permanent, Canopy Mart also sells the popular Arrow Storage Sheds line! Outstanding product selection from the smallest portable shelters to famous Shelter Logic portable garages, to backyard party tents to large professional Optidome event tents, and everything in between! Ability to finance your purchase! Exclusive coupon codes here at MyFavDeals.org, which can work with already discounted prices at the website, saving you even MORE money! Gazebos are increasingly becoming an integral part of our garden furniture choices, providing a safe and shaded area where you and your family can get out of the sun in warm weather, or stay out later into the evening without being bothered by insects. Some of the cheaper gazebos have just a roof with four poles to support it while others have fabric walls to keep you enclosed, sheltered from the wind or away from the annoyance of mosquitoes. While most are temporary and very mobile structures made from canvas and fabric and collapsible poles, there are more robust gazebo structures which have more solid posts and a metal or wooden roof. These are designed to stay put once assembled but they have the advantage of being strong enough to resist quite strong winds. Some of the top gazebo models available from Canopy Mart include the metal-framed Palermo gazebo with polycarbonate roof panels or the larger 11 ft by 15 ft Valencia gazebo from STC, with its aluminum and steel frame and fabric roof covering. If you are looking for a cheaper canvas gazebo, one that you can take on a camping trip for example, you could go for one of the Caravan range of pop-up tents; these are great for smaller families or they can be used for a day on the beach to provide essential shade for smaller children. If you are lucky enough to have a few trees in and around your back garden then you can use them to provide additional cover using an innovative Sun Shade sail from Canopy Mart. These are triangular or rectangular pieces of heavy-duty UV-treated polyethylene that can be securely attached to tree branches or fixtures on your house in order to create more shade in your garden — great for young children or to allow you to eat meals in the yard without having to put up with direct sunlight. Canopy Mart sells these in a variety of different bright, fun colors, and can become an attractive garden feature in their own right, as well as providing much needed shade. 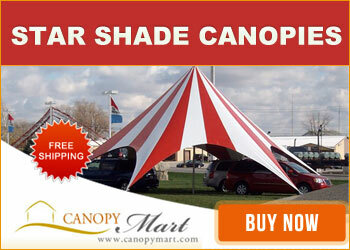 They also carry the popular event tents by both Optidome and Star Shade! If you have a smaller garden or decking at the rear of your property, a patio canopy can be a great way to create some shade. Canopy Mart sells the popular Feria range of patio canopies, solid structures which consist of three or four supporting poles and a roof made up of a few polycarbonate panels. These ensure that the area is in shade without becoming too dark and gloomy. These are available in a variety of lengths, from 24 ft to 60 ft, depending on the size of your house, as the patio canopy needs to be supported against a permanent wall. It is especially important to ensure that young children and pets have somewhere they can sit safely in the shade. Luckily, Canopy Mart sells a range of tents and canopies for both. They have a great selection of colorful and fun children’s play tents. Some, like the Fantasy Gazebo, are designed to look like a fairytale castle while the website also sells play tunnels in different colors, designed like cartoon caterpillars. There are also robust play tents that can be used in the comfort of your back garden or for a day on the beach — where it is vital that young children have somewhere they can sit safely out of the sun for a few hours. You can even buy shaded kennels for your dog to ensure that they don’t get too hot if they are spending time out in the back garden. The shaded dog kennels on sale at Canopy Mart are available in two sizes: 4 ft by 4 ft or 8 ft by 8 ft; if your pet is going to be in it for a few hours then you need to make sure that the kennel you buy is appropriate to their size. Everyone wants to be able to enjoy the sunshine in their back garden or when they are away on holiday, but it is equally important that you take proper care to ensure that you and your family are protected from the sun, especially at the hottest time of the day in the early afternoon. Whatever the size of your garden, there will be a gazebo or canopy that will fit your needs perfectly, and Canopy Mart sells dozens of different products, in a variety of process to suit all budgets. They even make sure that youngsters and treasured pets are taken care of with their range of shaded play tents and kennels to keep all members of the family safe in the summer sun. Canopy Mart DOES have a number of coupon codes and special sales. One of the best ones? Our very own private (exclusive) Canopy Mart promo code that gives you 8% off everything you buy at the website! See the Canopy Mart Coupon Codes HERE. Click www.canopymart.com to go directly to the site to shop, and be sure to use our coupon code FAVDIS to save 8%! See Individual Canopy Mart Products and Coupon Codes: Click HERE to see some of the individual product specials that we’ve listed here as well! Nutritionists tell everyone to eat enough fiber, but you didn’t know DIY experts were into the fiber trend, did you? This is not an edible fiber, though, and not the sort you find in a grocery store. We are talking about FiberFix and this review will reveal why every household needs some in their lives. Just a word of caution before we get too deeply into this review. There is a good chance that once you read the following article, you will want to rush out and buy some; not a bad idea. I recommend you treat this stuff with the sort of caution reserved for crazy glue and cigarette lighters. Children and FiberFix do not mix unless you really want them to stay put somewhere. When it hardens, no parent would want to be trying to get this material off of skin, trying to rip it from furniture, or attempting to unwrap it from around the cat. Read further and you will see what I mean. FiberFix comes from a US team of engineers and innovators including Spencer Quinn. He was looking for materials that would work like medical tape but would be moisture proof and bond fully. This would involve finding a resin to make their tape many times stronger than duct tape. The team launched their product, took it to Shark Tank, and it became a huge hit. Investment money took them to the next level and they went from selling in over a thousand stores to getting their product into more than 30,000 locations. This tape really is far more durable than duct tape; it has been subjected to testing under university conditions and the veracity of Quinn’s claims that it is “100 times stronger than duct tape” are revealed to be an understatement every time someone finds a new way to use it. Not every surface is suitable, especially flat surfaces, and shiny ones will have to be roughened first, but try everything from tools to the chassis of your car and see what Quinn’s project is capable of. Always wear gloves first, though; if the resin gets on your skin it has to be scrubbed off with an abrasive surface or you can wait for nature to have its way and for dead cells to take FiberFix with it. One of the best resources for information is the FAQ section from the FiberFix website. Here you will find out how it works by exploring customer’s most common questions. For example, any adult can use this product. No tools are required but one should always apply a bit of common sense. Prepare the area ahead of time. Know what you want to fix and have someone around to help keep parts straight. For instance, if you are re-attaching the leg of a chair, you want the two parts to fit neatly together because the only way to break the bond once set is to break the chair leg. It is best used as a wrap, not as a hole patch. New products from the same company have been released to address those types of fixes, but we will get to those in a minute. The original stuff is best for curves and the product should form layers. Resin forms a solid bond. How does it work? Cut FiberFix from its roll. Get it wet and wrap the stuff around a pole, pipe, chair leg, etc. Let it dry. You can hasten the process by using a blow dryer. Also, warmer water speeds up the process compared with cold water. Temperature is important for speed only; FiberFix is resistant to extreme temperatures. A vinyl strip is included with FiberFix and people often wonder why they would need that if the product is so good. This strip is not used to augment a repair but to help you press layers, strengthening the bond. That is all it does. Your fix would work without it. How long should it take for FiberFix to harden? That depends again on temperature, how wet the tape was, and whether or not you use some method to hasten the drying/heating process. For instance, next to a furnace this product will not catch fire but will get lovely and warm. But if your item is going to be left outside, you might need a day for the repair to fully take effect. Why is FiberFix so much better than duct tape? This is really almost like homage to that historic product Red Green so loves to use on anything. What would he do with a roll of FiberFix? He would find all the places where duct tape had started to peel off due to a shoddy application and dampness. Although proper duct tape is really tough stuff, it does not bond to things or its own material. Wrapping something forms layers of defense but does not create a bond the way FiberFix does. Commercials showing duct tape and FiberFix used to make roll cages are not exaggerating: duct tape is still flexible at several centimeters of thickness while FiberFix is like cement. Its not super expensive to buy in spite of its amazing properties either. Now that FiberFix has traveled the country, its makers have decided to launch it to the world too. You can buy it directly from a Canadian website and you may also find it in many locations worldwide. The original product has been diversified and there are numerous items one can purchase. The best deals could be found on the FiberFix website where there are special bundles and a chance to watch a video of two cars showing what happens when one is wrapped in a roll cage made of FiberFix and the other cage is made from duct tape. Give your DIY enthusiast a new reason to go on a household fix-it mission and the following month could see every little job completed at a low cost to the relief of an entire household and its groaning budget. Now that you know about the history of FiberFix and how it works, maybe it is a good time to become acquainted with their short product line up. The online store offers some deals, but you can buy certain items at this shop and others at another store; they’re spread around the retail world online and in stores. FiberFix comes in several sizes and there are more products from the company besides their tape. Moreover, there are multiple formats and one gets the impression they will be developing more FiberFix products in the future. Most items from FiberFix are sold as rolls, the way you would expect to encounter duct tape or medical tape. It has to be sealed, of course, because water activates the resin to form a bond. There are three widths available: 1 inch, 2 inches, and 4 inches. I recommend trying some out before ordering a bundle or a multi-pack, but once you know how and where to use it, order three 1-inch rolls at a time or two 2-inch rolls rather than one at a time. This is the easiest way to save money on a product which, let’s face it, reduces your repair bills by a considerable amount. In fact, your spouse might get a little frustrated that you never need to buy anything new. Every home and office should keep at least one roll in the drawer marked “miscellaneous” and every tool box should contain some too. Keep it stored in a moisture-proof environment. So a roll of 1-inch tape costs $5.99. The triple pack, however, costs just $12.99 or roughly $4.33 per roll. With the 2-inch version, you pay $8.50 for one or $12.99 for 2 ($6.50 each). Try a four-inch tape for $9.99, not available in multi-packs. Another product, released to address flat surface repairs, is the 10X Tape for $11.99. It is not as tough as FiberFix but reputedly ten times stronger than duct tape. A person cannot rip or tear it but 10X Tape is more flexible than FiberFix and does not harden like cement. It does not form a bond either. FiberFix supplies a small retractable razor so you can cut 10X Tape easily, but scissors are also useful in this case. A Heat Wrap is designed specifically for use in high heat settings, although the original FiberFix is resistant to extreme heat as well. Wraps are ideally suited to furnace fittings, hot water pipes, and car exhausts. Don’t forget: the FiberFix wrap is heat-resistant, but you are not. Make sure pipes are cool when you apply the tape. Bundles are excellent value. FiberFix is offering three bundle sizes online only and these come with multiple sizes of FiberFix rolls, patches, and pens. The patches are meant for flat repairs like holes in your car frame or in a wall perhaps. Reviews for this product are not as promising as testimonial about original FiberFix, but it’s part of the bundle anyway and not sold separately on their website. That could be a sign the patches have been removed or are currently back in the development stage. The pens are interesting. One holds 10g of resin. Use this to seal cracks in metal, glass, ceramics, etc. then turn the UV light onto a surface for the resin to harden like cement. A Flash Pen is similar, but you are spraying crazy glue into cracks and materials you choose for this purpose are porous, like wood. Turn the light onto a surface to heat it solid. For readers with a latex allergy, it’s worth noting that the people at FiberFix were thinking of you. The gloves included with their rolls of FiberFix are made from plastic. Alternatively, you can buy your own, of course, just to keep the resin away from your skin. But it’s a nice touch to be sensitive to one of the most common skin allergies if you ask me. Left to form a basic repair without being enhanced aesthetically, FiberFix is no prettier than duct tape medical tape, electrical tape, etc. The advantage of this material, however, is that once hardened it can be sanded smooth without destroying the repair. Now you can paint an area. Of course, raised areas will remain; you have not bonded two pieces together on the inside as you would with crazy glue. At least a surface can be restored to its original color, however, and tidied up. FiberFix has established an image for itself as a manly man’s product. Call them chauvinists if you like but FiberFix is appealing to a stereotypical audience – the handyman – that guy who refuses to call a plumber, carpenter, or mechanic until he has tried every form of adhesive known to man in order to stop that leak, fix that crack, or address that rust hole in his muffler. He doesn’t want to pay $100 an hour. As a result, you will see many references to the “Manly Man” around their website. Don’t let it bother you, DIY women. There are lots of handy females out there, but they can rise above the bias. It is undoubtedly a male tradition to try and look after everything without asking for help and an accurate stereotype. Not only is it accurate, but that guy with a roll of FiberFix around his arm wandering around the house and yard isn’t drinking or gambling, so let him have his hobby and feel technically gifted if only for a little while. If he gets out a hacksaw, though, maybe ask a few questions. Finally, if you do not believe all that you have read here today, take a look at what real people have done with FiberFix. This amazing adhesive is all over YouTube, Amazon, and the FiberFix website. Videos, pictures, and articles demonstrate how versatile and simple the subject is. You don’t need a degree in engineering or a gifted mechanical mind to figure out how to use it and the fix will be effective for a long time.